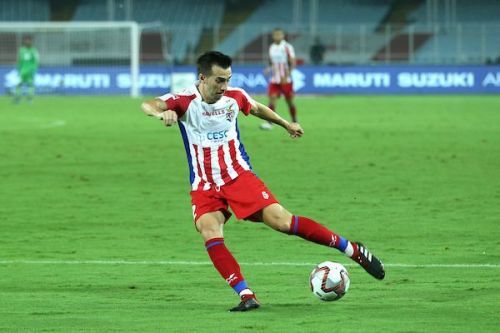 ISL 2018-19: Will Manuel Lanzarote regret leaving FC Goa? The Spaniard was considered quite a coup for ATK when they lured him away from FC Goa during the summer. The 34-year-old had an impressive last season with FC Goa, clocking well over 1500 minutes on the field with 13 goals and 6 assists to his name. His formidable partnership with fellow countryman Ferran Corominas was one of the highlights of the Indian Super League (ISL) season 4. The duo ran riot as they notched up an impressive tally of 31 goals between them, helping FC Goa to a third-place finish. After a nightmarish 2017-18 season, ATK completely revamped their squad and owners spoke of building a “team for the future" and Lanzarote was supposed to be a big part of that, and with good reason. Anyone who watched him last season at Goa will know he can thread passes through the eye of a needle and looks more composed than anyone with the ball at his feet. His ability to glide past players and pick out the attackers with probing passes easily makes him one of the first names on the team sheet. In short, he has that knack of making the sublime look entirely easy. There are high expectations from the Spaniard at ATK this season, but early signs look ominous. Lanzarote has so far struggled and failed to make an impact in his first two games at ATK. The problem could be Steve Coppell’s pragmatic approach - an overtly defensive style that is based on long balls, skipping the sector where Lanzarote plays. Coppell received much criticism last season for his overwhelmingly defensive stance and inclination to a negative brand of football. He further added, "Football is not always about attack. For a coach, a clean sheet is the most pleasurable thing." That’s not pragmatic; that’s ideological. Contrast that with Sergio Lobero’s Goa team - a side playing free-flowing, attacking football, where you’re encouraged to get the ball forward. The team’s possession-based style of play perfectly suited the Spaniard’s attributes and brought the best out of him. While Sergio Lobero is an evangelist for open, attacking play, Steve Coppell is the polar opposite - a manager who is famous for winning ugly with teams built on defensive solidity; he doesn't mind sacrificing entertainment for success. The two managers have completely different ways of playing football. It remains to seen whether Lanzarote can evolve and play the way Coppell wants to play and recapture the sublime form he showed under Lobero at FC Goa. ISL 2018-19: Predictions for top four - Who all can make it?